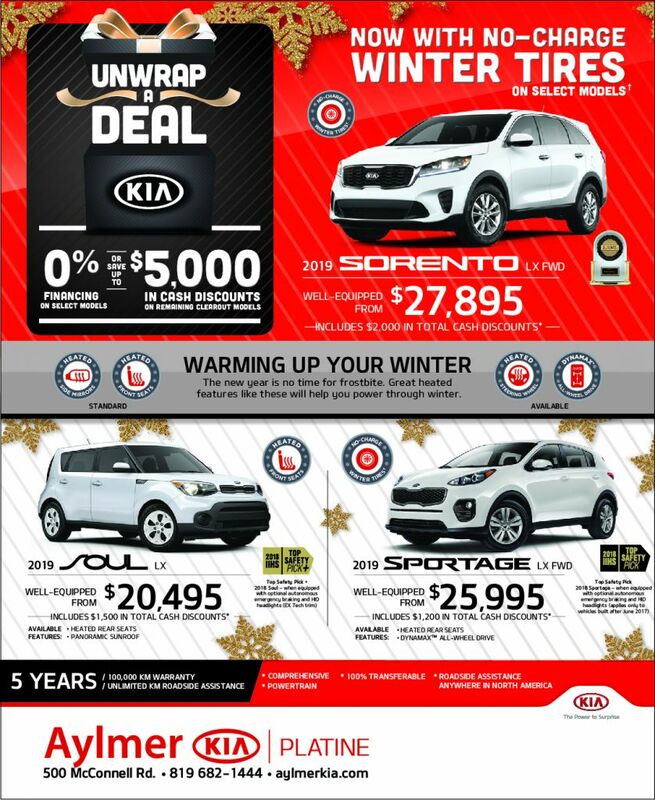 UNWRAP A DEAL @ Aylmer Kia Gatineau Kia Dealer QC. Φ0% financing on select 2019 models on approved credit. Representative Financing Example: Financing offer available on a new 2019 Sorento LX AWD (SR75BK) with a selling price of $32,195 is based on 208 weekly payments of $155 for48 months at 0% with a $0 down payment, RDPRM fees, including agent fees (up to $110) and first weekly payment due at finance inception. Cost of borrowing is $0 for a total obligation of $32,195. 0% financing for up to 48 months offered OAC on new 2019 Sorento LX AWD (SR75BK). Only the 2019 Sorento LX AWD (SR75BK) model has a true 0% rate. In all other cases there is a nominal financing charge of up to $110 to cover the RDPRM and agent fees. *Cash Purchase Price for the new 2019 Sorento LX FWD (SR75AK)/2019 Soul LX FWD (SO752K)/2019 Sportage LX FWD (SP751K) is $27,895/$20,495/$25,995 and includes $2,000/$1,500/$1,200 cash discount. Discount varies by model and trim and is deducted from the negotiated selling price before taxes. †No Charge Winter Tire offer available on the purchase/lease of a new and unregistered 2018 Forte, 2018 & 2019 Sportage and 2019 Sorento between November 1 and November 30, 2018. Wheels are excluded and may need to be purchased by customer. Installation, storage fees and tire tax are extra and vary by dealer. The brand of winter tires and tire size are at the dealer’s discretion. Value of winter tires varies by trim. Offer is subject to certain conditions and may not be converted to cash. The 2018 Soul was awarded the 2018 Top Safety Pick+ by the Insurance Institute for Highway Safety (IIHS) for model year 2018. The 2018 Sorento and 2018 Sportage were awarded the 2018 Top Safety Pick by the Insurance Institute for Highway Safety (IIHS) for model year 2018. U.S. models tested. The Kia Sorento received the lowest rate of reported problems among midsize SUVs in the J.D. Power 2017-2018 Initial Quality Studies of new vehicle owners’ experience with their own vehicle after 90 days of ownership.All pricing and payments include delivery and destination fees up to $1,785, new tire tax ($15) and $100 A/C charge (where applicable). Excludes licensing, registration, insurance and applicable taxes. Offer(s) available on select new 2018/2019 models through participating dealers to qualified retail customers who take delivery from November 1 to 30, 2018. Dealers may sell or lease for less. Dealer order may be required. Some conditions apply. See Aylmer Kia dealer for complete details.